Considering that Riedell has been making quality skates for over 70 years, it comes as no surprise that a large number of people swear by Riedell. If you’re one of them – like me! – and have been using a Riedell skate for quite some time, it is natural to assume that you’d get an equally well-made product now. This may be true, but technology changes rapidly, and so Riedell roller skates for women may be very different from what they were a few years ago. Below I’ve given some of the top benefits (and a few potential drawbacks) of Riedell I feel will impact your purchase, and then followed up with some skate suggestions that could save you a few hours of research and comparison. Quality KWIK bearings that possess ABEC ratings based on the segment they are targeted for. These bearings are key to the skates proving to be fast and balanced across a range of surfaces. Heat-activated reinforcement that keeps the feet snug in the hand-made boot. Great stops that are large without being obtrusive. Urethane wheels that adhere to durometer-specifications at all times and are quiet even at high speeds. Nylon (and sometimes aluminium) plates that are adjustable without being wobbly, thus aiding in balancing and rapid manoeuvres. Simple and efficient lacing system with a number of lace choices. Options to get a skate made entirely to custom specifications should one feel Riedell’s existing range is not versatile enough! Wheels may need some “breaking in” before they spin freely and completely silently. Lack of complete leather boot options. Some professional artistic/figure skaters, however, managed to have the boot changed without much additional expense. Top stops occasionally need to be changed to ensure proper functioning of the product. Changing and replacing wheels a somewhat complex phenomenon for those newly entering the world of skating. Somewhat older production batches shipped without any adjustment tools or instructions on how to change the wheel and plate. One of the best options for Riedell fans entering the world of casual figure skating, the Citizen maintains a simple but dignified appearance courtesy of the white design and lack of bells and whistles. Mandatory features like ABEC-5 bearings and PowerDyne plate, however, have been duly included to provide unmatched balance and freedom to manoeuvre. Add bolt-on stops and excellent wheels and you have skates that are as versatile as they are easy to control. Rather interestingly, these skates did not even suffer from the slight stiffness that I found in other Riedell skates. 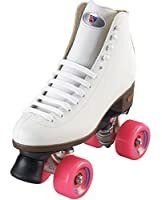 While some were not amused by having to order one size down from what they normally bought at the shoe store, the overall effect was good enough to earn it the top slot among Riedell skates in the market! Close on the heels of the Citizen is the Angel, having a similar aesthetic touch but a somewhat different specs sheet. For instance, you get the Riva wheels with the Angel, which allows you to handle surfaces with greater ease. The bearings and the plate, though, are the same, and ensure that you receive the same stability and durability you’d get on the Citizen. While a few users preferred to go with a Citizen-like configuration and thus changed the wheels, I personally found them to be as responsive as the best of Riedell. Rink tests have also proved the same for most people, so replacing the wheels is not really a necessity. The boot, interestingly, has some width variation depending on whether the boys’ or girls’ series are bought. Users who did end up buying boys’ skates could easily mitigate this problem by wearing somewhat thick socks. Coupled with great lacing and an excellent inner padding, this solution makes the boot as much an all-rounder as the lower sections. A somewhat cheaper competitor, the Wave stands out for being a highly compact yet sturdy and versatile skate, meant for both the sports as well as the dance enthusiast. Keeping in mind the needs of both groups, Riedell has provided wheels that can be used both in the rink as well on concrete, as I learned through trial. The wheels do not rotate a lot when spun by hand, but hold up well when on a surface. Some users feared getting peat on the wheels if they skated on non-concrete areas. Other users however, have noted that the wheels are resistant enough for this to not be a problem. Indeed, with these skates having the same ABEC bearings and adjustable plates as the others, these features ensure you don’t end up having to change any parts in a hurry. The shoe is compact and comes in the standard white colour. Unlike the Angel, this shoe runs a little narrow and would require that you buy one size bigger than what you would normally do. Once done, the fitting and lacing systems keep your feet snug without sweating. These make this shoe a great choice for anyone angling for a professional sporting or dance circuit. It has been my desire to highlight the differences so as to make decisions easier to make. 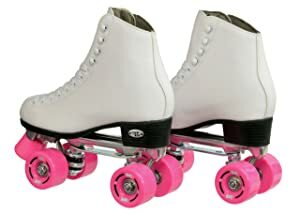 However, should you not find your skate among the ones mentioned above, you can rest assured that the basics of all Riedell roller skates for women will be the same. Hence, even if you cannot find your dream skate among the ones I’ve covered, you need not worry because chances are the ones you do find will at least have similar basic features and quality assurance. 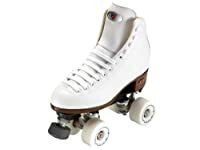 Combine these with your skating style and budget and you can confidently set out on the smooth skating sojourn you’ve always dreamt of!